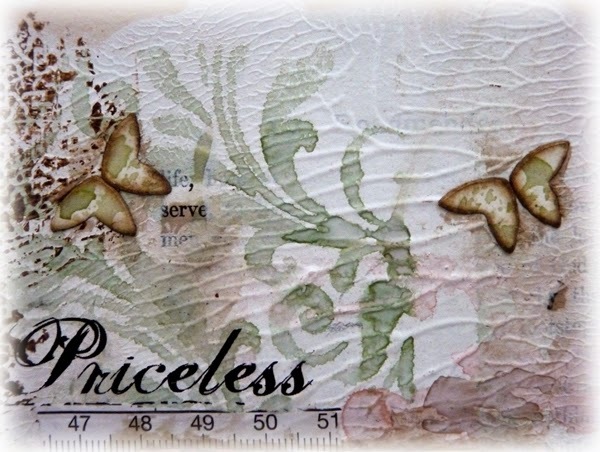 When I got back from London Sunday night there was a box of new goodies waiting for me that I had ordered from Country View Crafts and inside were Tim's new stencils, so I decided to use a couple of these on my pages this week. There were also some re-inkers I had ordered and I love using these to make up my own colours for misting and spraying. These two pages use the brand new CHA release Flourish and Blossom stencils, the flourish one worked really well on the textured pages, but the blossom one is more delicate and I think will work better with blending inks. The green colour is a mix of 3 drops of Stormy Sky to 1 drop of peeled Paint and the pink colour is equal parts of Worn Lipstick and Dried Marigold. I use Crafts Too misters but you could use Tim's mini misters if you have some. Here you can see the textures on the pages - this is such an easy technique - paint gesso on both pages and close them together. When you pull them apart you get this wonderful ridged effect. 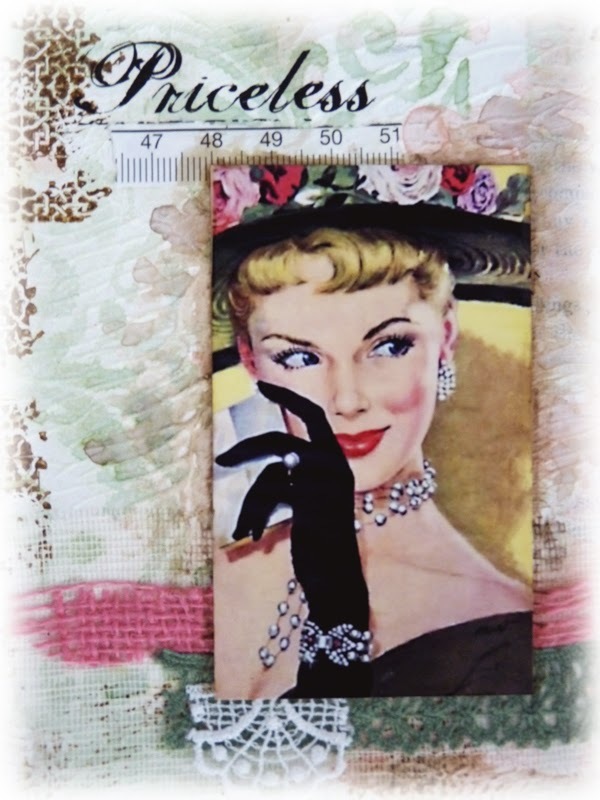 I have an A4 box of vintage images and when I saw this one I loved the retro feel, and made a couple of very feminine pages to go with it. To create some shadowing effects I edged the image and the diecuts with walnut stain mixed with matte medium and just painted it on, rubbing it thinly over the page where necessary. 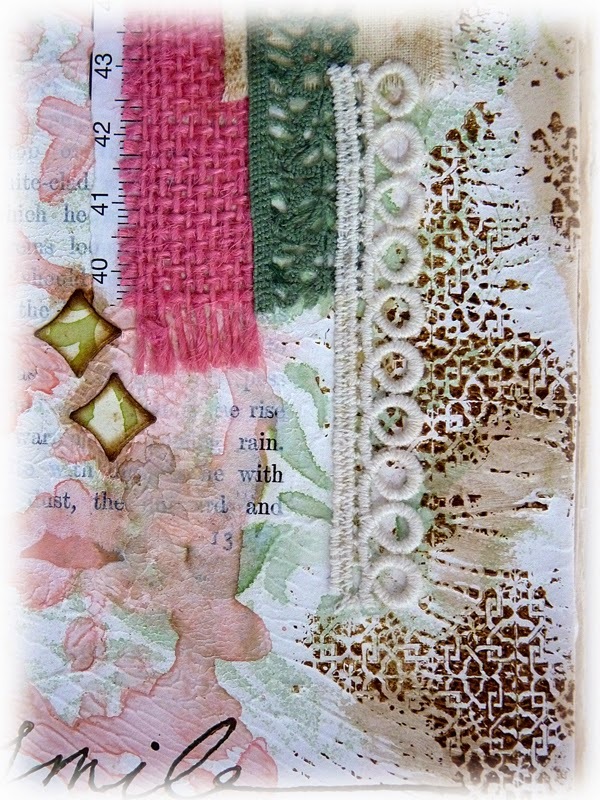 Lots of fabric textures including lace and hessian which also bring the colours in to blend with the background and the image. 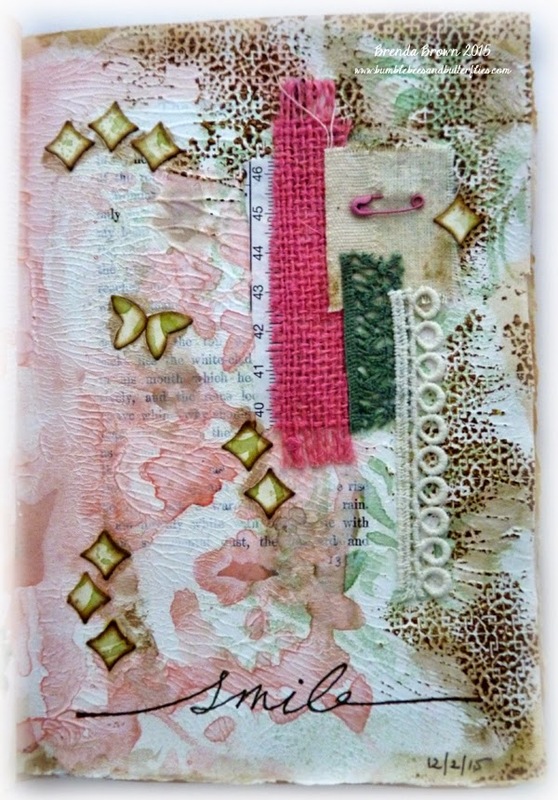 I made these little butterflies from left over pieces from a card I was making, they are scraps from one of Tim's new mixed media dies. The patterned edges are a clear stamp I keep in a box to use as fill-ins and stamped in potting soil archival ink. The little pin and the measuring tape just add further interest. Thanks to all of you who have already linked for February, what a lovely surprise to see so many fabulous pages on Monday. Always listen to the heART. Beautiful Brenda, so soft and feminine! 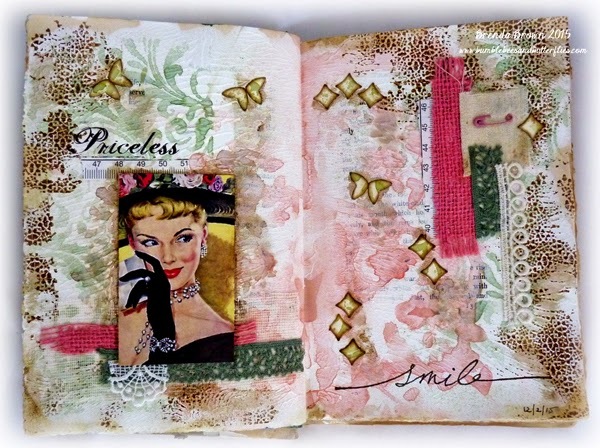 Love the texture on your pages as well, thanks for the tip! 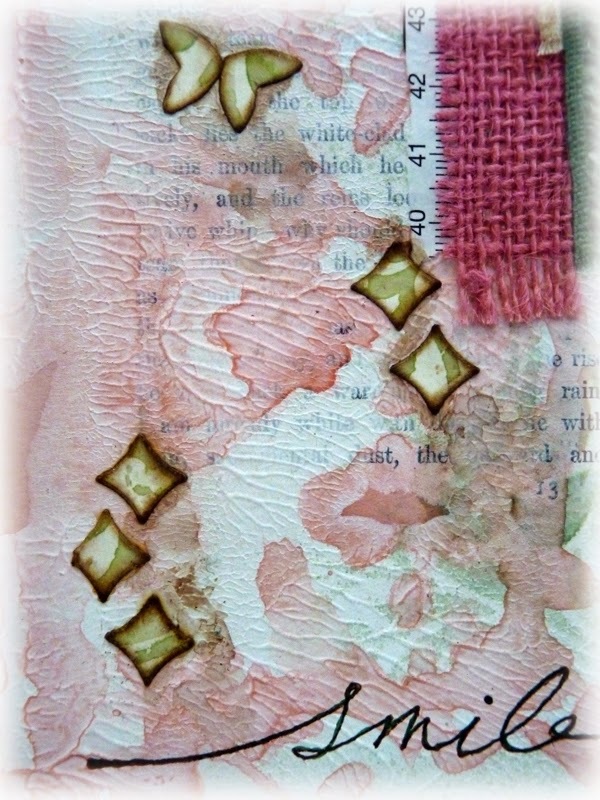 I love the image first up, and I am so pleased you did not grunge it up, you kept it soft and adding a mix of media especially that little Pink pin is fabulous..yes it is priceless. What an amazing spread Brenda! Lovely! 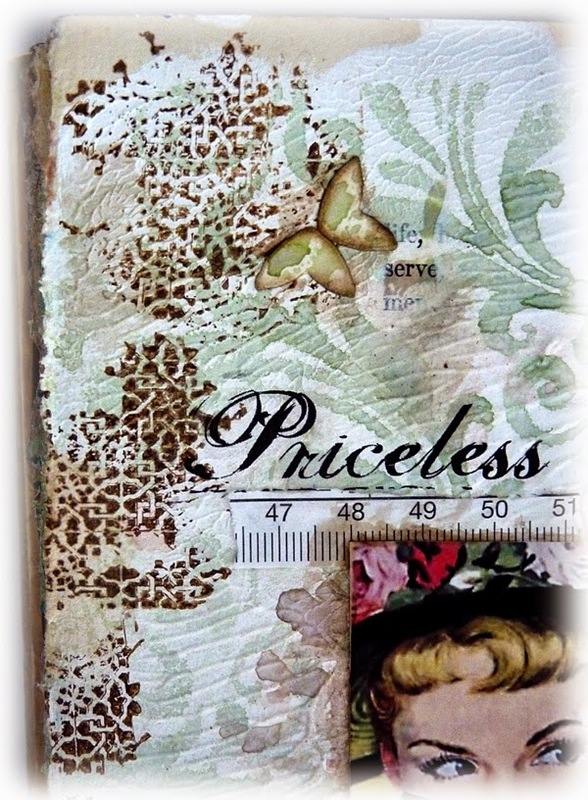 Love all the textures on your pages, Brenda. 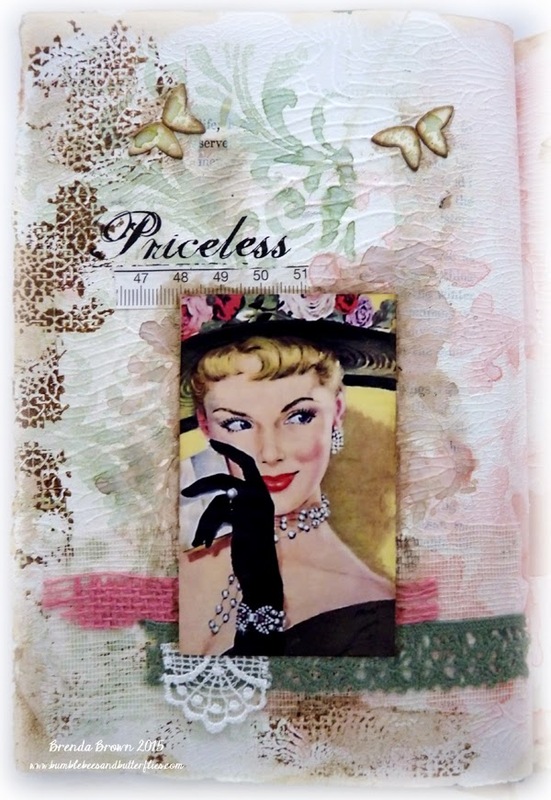 The Tim stencils add just the right touch and the retro image is fabulous. She looks a real character. 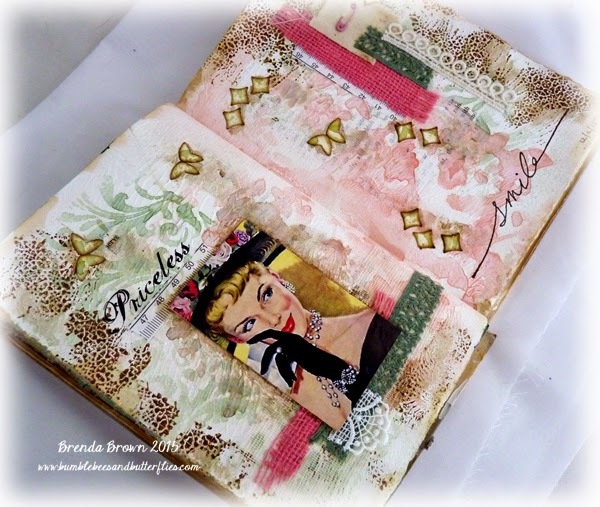 Fabulous pages again Brenda! Those new stencils look wonderful! Such a lovely page! Goreous texture and shade of colours!